Our staff consults with individuals, businesses, communities and cities to confront the vulnerabilities and risks faced by a changing environment, including sea level rise. We work with our clients to design and implement customized assessments with the goal of adapting to specific challenges and remain resilient against physical, social, and economic stressors. Our team has successfully carried out comprehensive vulnerability assessments for local communities and businesses and has assisted private citizens through their personal adaptation journeys. 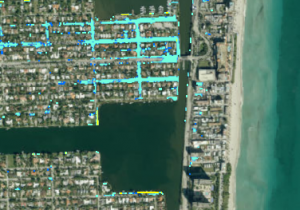 Brizaga offers vulnerability assessments and strategic adaptation planning guides to our clients, designed to examine the impacts of sea level rise on the transportation and infrastructure systems, tax revenues, and population of the study area. We focus on the incremental changes expected as a result of tidal flooding to identify and prioritize rehabilitation and mitigation projects, considering the physical, social, and economic benefits to the community. Each study begins with the collection and filtration of data. Typically, this includes topography, property boundaries and values, land uses, census data, local sea level rise projections, and historic water levels. Our team combines all of this content into a Geographic Information System (GIS) to assess the specific properties, locations, and components within the community that may be at risk of experiencing flooding during the study period. Our Sea Level Rise Ready™ Program is designed to be an individualized adaptation needs assessment with an individualized roadmap. For more information, please visit https://ready.brizaga.com/building for more information.